This tutorial explains how to set up ELEX Authorize.net Payment Gateway for WooCommerce. Please refer to the product page to know more about the plugin features. For WordPress site, ELEX WooCommerce Authorize.net Payment Gateway Plugin allows Admin to accept credit card payment as well as eChecks through Authorize.net payment gateway. This plugin facilitates to sell the products for which customer can make the payment using the credit card (Master Card, Visa, American Express, JCB and Diners Club), or eChecks without leaving the WordPress site. 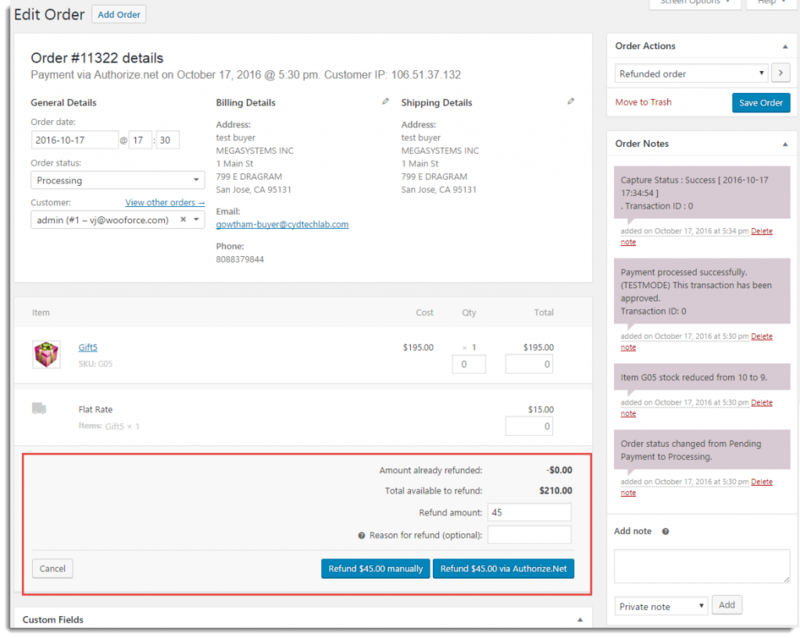 From Individual order page, you can capture or refund the payment in a click. Refund can be partial or full as per the requirement. You can also see all the transaction details with Transaction ID under Order Notes. 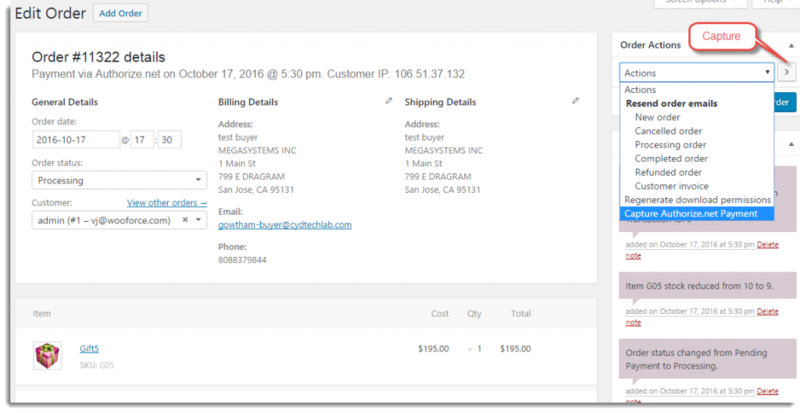 You can customize the text of Order Button on the checkout page. This tutorial will give you an excellent launch pad to kick-start the usage of Authorize.net Payment Gateway for WooCommerce. It will give you all the essential knowledge and step-by-step instructions. Login ID and Transaction Key of Authorize.net Account. 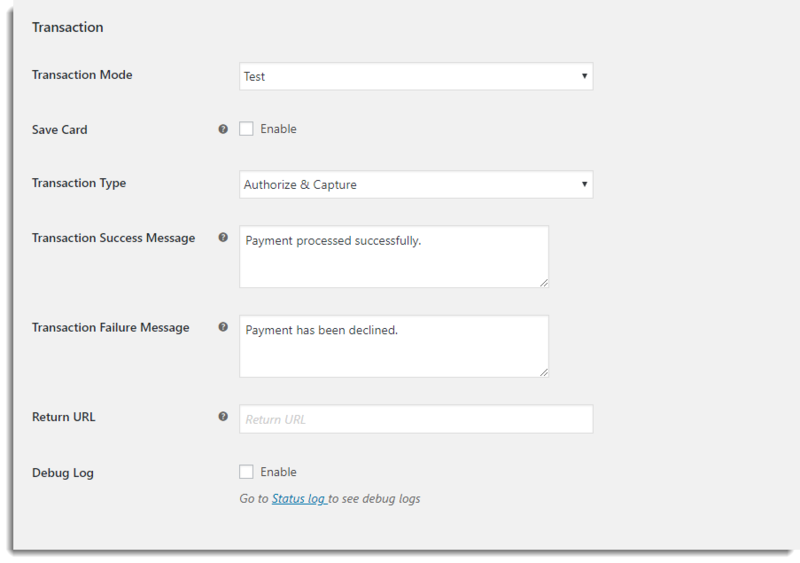 Navigate to Plugins > Installed Plugins > EH Authorize.net Payment Gateway for WooCommerce >Settings. The plugin consists of two main sections Authorize.net Card and Authorize.net eCheck. This section makes your website ready to use Authorize.net payment gateway to accept credit/debit cards on your online store in a safe way. 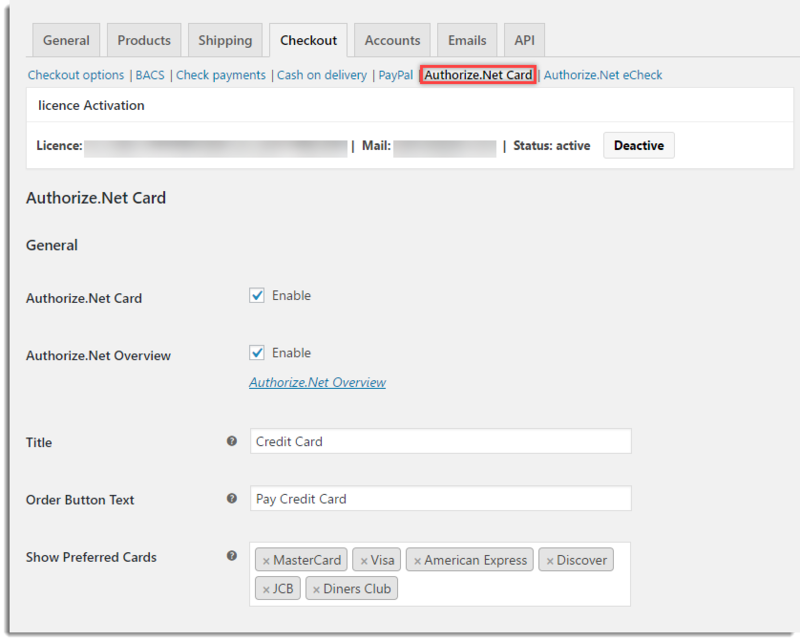 Authorize.Net Card: Select the checkbox to enable the Authorize.Net payment gateway so that payment gets accepted through cards on your online store. Authorize.Net Overview: Select the Enable check box to enable Authorize.net Payment Overview. On this page, you can capture or refund the payment in a click. Refund can be partial or full as per the requirement. You can also see all the order details. This page also shows you a graphical representation of the Overview of the Authorize.net Payment for the selected date range. You can also see the Captured, Uncaptured, and the Refunded amount in USD. For more information, See Authorize.net Payments Overview Page. Title: It is visible on the Checkout page under the payment modes. Specify Title as required (defined by you). Order Button Text: Specify the required description in this text box. 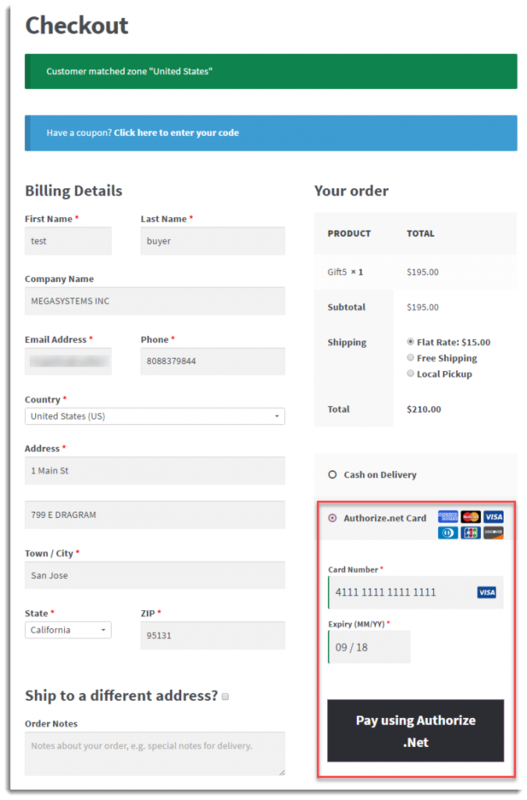 The Customer can see this description on the Checkout page under Authorize.net payment method. Show Preferred Cards: Select the desired cards from the multi-select box. The logo of the selected cards will be displayed on the checkout page. Login ID: Enter the unique key provided by Authorize.net. This key is used to validate the request with Authorize.net. Transaction Key: Enter the Transaction Key provided by Authorize.net. CVV Number: Card Verification Value on your credit card is a 3 digit number on VISA® and MasterCard® credit cards. On your American Express® branded credit card, it is a 4 digit numeric code. Select the checkbox so that the customer needs to fill the CVV number at the time of checkout. Test: It is used to do test purchasing by using Authorize.net API. There is no real money transaction involved in this mode. Note: This mode is used only for development purpose and Customers should not have access to this mode. Live: Live mode is used for actual purchase. Save Card: Tick this checkbox save card information from registered customers. The registered customers can also view the card details in the Payment section in their account page. The plugin provides an option to delete the card details as well. Authorize & Capture: This option allows the shop owner to get the payment immediately after the order is placed. Authorizing and Capturing of the payment happen automatically. Authorize only: With this option, shop owner needs to authorize charges and then capture the payment. 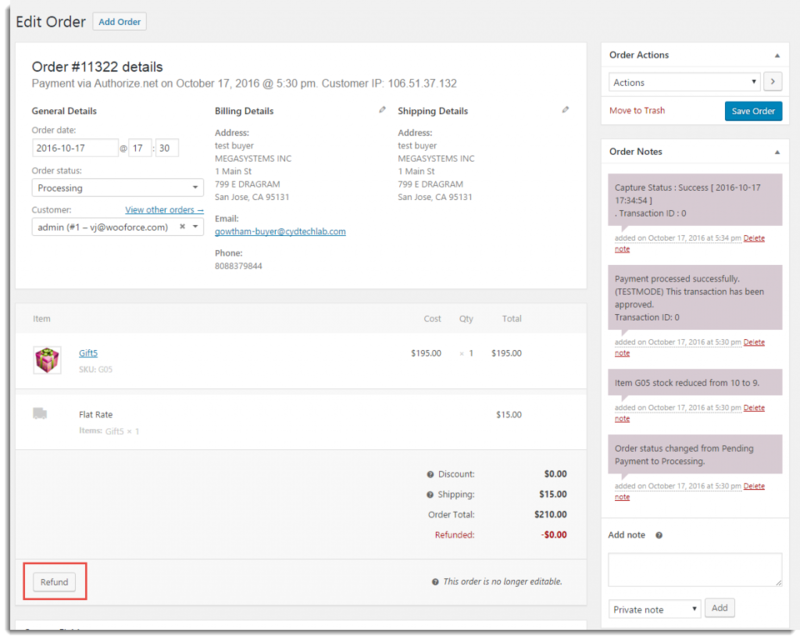 To capture the payment, the shop owner needs to navigate to an individual order page. Under Order Action box, Admin can capture the payment. Please refer, How to Capture and refund Authorized payment from Order Page? Transaction Success Message: Enter the message which displays in Order Notes on successful transaction completion. Transaction Failure Message: Enter the message which displays in Order Notes on a failure of a transaction. 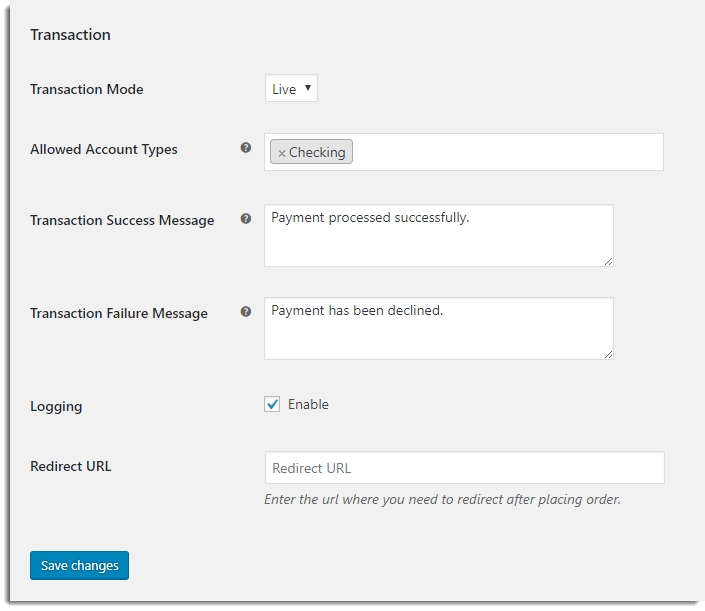 Logging: If you are not getting the payment options or any issue, then you enable logging option to find an error(s). By enabling logging, you can trace the issue using log. Enable the checkbox to troubleshoot the issue with your site. Redirect URL: Once the payment is successful with Authorize.Net card, you can redirect the payment success page to a custom page, instead of redirecting to WooCommerce default payment successful page. You can provide the URL for the same in this textbox option. Click Save changes to save/update the plugin settings. Select Authorize.net Card as a payment option. Enter Card Number of the Credit card. Enter the Expiry date of the Credit card. Click Pay using Authorize.Net (customized text) to the checkout. This way the customer can place the order by Paying through Authorize.net securely. This section makes your website ready to use Authorize.net payment gateway to accept eCheck (accept and process payments from bank accounts directly through your website or the Authorize.Net Virtual Terminal) on your online store in a safe way. You can accept electronic checks in addition to credit cards, or choose the only eCheck. 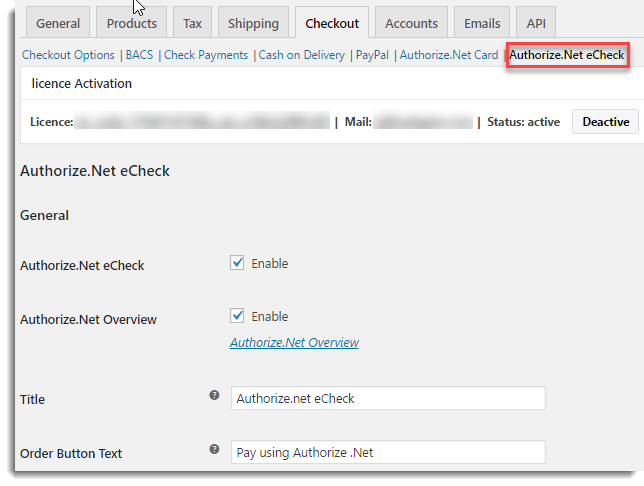 Authorize.Net eCheck: Select the checkbox to enable the Authorize.Net payment gateway so that payment gets accepted through eChecks on your online store. Checking: Allows eCheck payment through a current account. Business Checking: Allows eCheck payment through a business account used for business finance. Saving: Allows eCheck payment through a saving account. Redirect URL: Once the payment is successful with Authorize.Net eCheck, you can redirect the payment success page to a custom page, instead of redirecting to WooCommerce default payment successful page. You can provide the URL for the same in this textbox option. Select Authorize.net eCheck as a payment option. Enter 9 digit Routing Number. Enter 17 digit account number. Select the required account type from the Account Type dropdown list. Click Pay using Authorize.Net(customized text) to the checkout. This way the customer can place the order by Paying through Authorize.net eCheck securely. 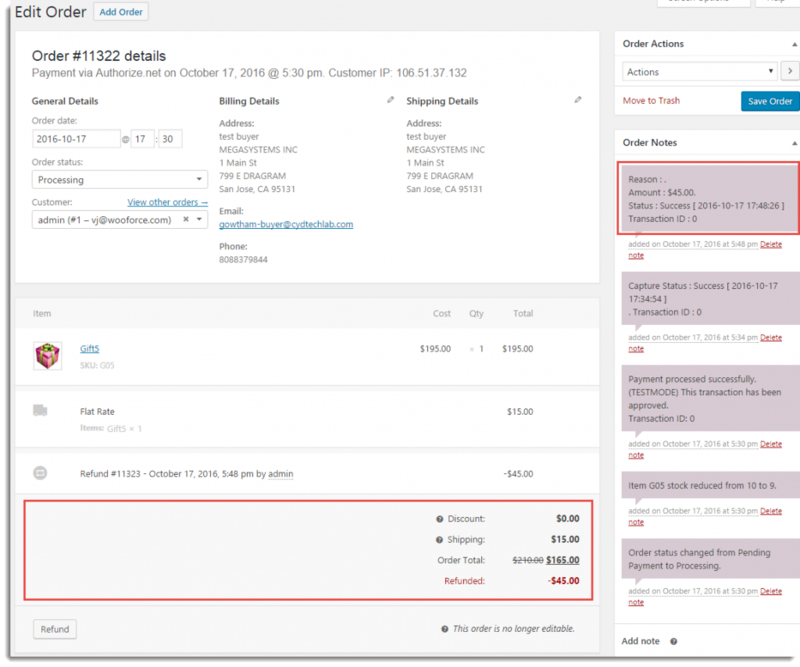 How to Capture and Refund Authorized payment from Order Page? 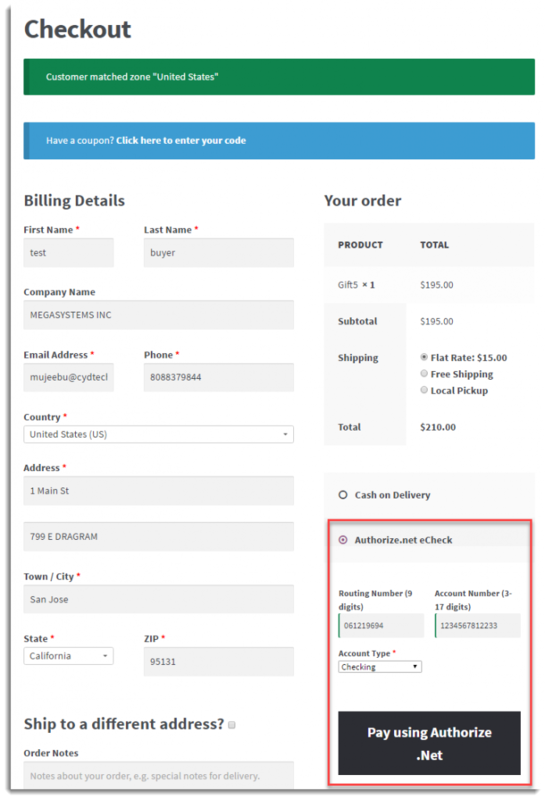 Under Order Action box, select Capture Authorized Payment option and click the arrow button to capture the order payment. You can see all the transaction details under Order Notes. This way the Admin can capture and refund the order amount through Authorize.net securely. In the Overview, you can see the total Captured, Uncaptured and the Refunded amount by the Amazon Payment Gateway. As per the need, you can refund the Full or Partial amount. The Plugin provides you the option to show the required number of rows under order details by using the Table Row option. Also, you can search the required order by using the search option. To explore more details about the plugin, go check out ELEX Authorize.net Payment Gateway for WooCommerce.